Hello! Well, it’s the last week of the summer hols for us – boo! I think this has been the quickest year yet! The kids are just about ready, but before you know it it’ll be half-term again in October! The card that I’m sharing today was one that I made a while ago. I was looking for something else and found this Smirk Decoupage Pad – For Her. This was bought in my early days of card-making so I thought I’d give it a bit of an airing! I don’t know if you can tell from the photo’s but parts of the flowers are glittered. 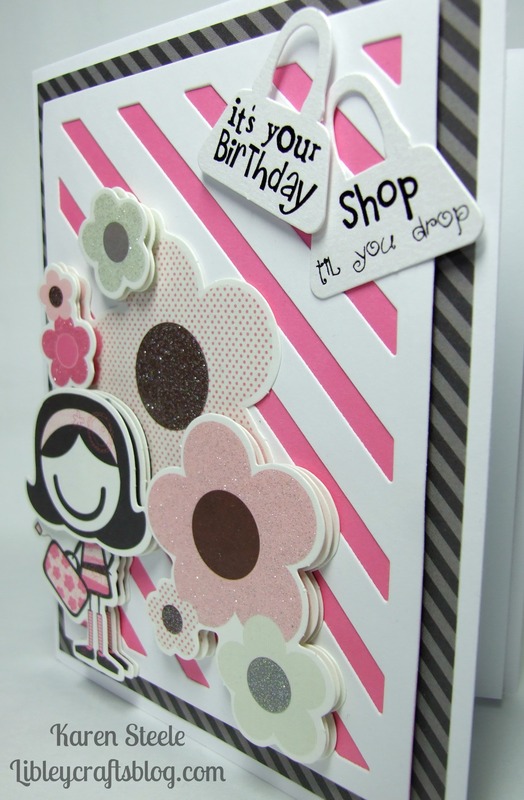 To make this I also used the following: Pink paper from stash, Lawn Fawn – let’s Polka in the Dark paper, Lawn Fawn Striped Backdrop Die and die-cut handbag sentiments from Craftwork Cards. That’s all from me for today. Thanks for stopping by and I hope you have a great weekend – and if you’re in the UK – a lovely Bank Holiday! So cute, Karen! I remember having some Smirk stamps several years back! Love this. Enjoy your holiday! Oh, so very cute!! Love the little girl shopper and all the pretty flowers!!! Brilliant 1960s cool. Of course I love it – when do I not? Super cute, Karen! Love the little girl and all the fun dimension! This is such a happy design, ultra feminine and love the retro style of the flowers! Love it, Karen! Sweet Card, Karen and with the Sentiments i think it´s perfect to put money or a gift Card inside.